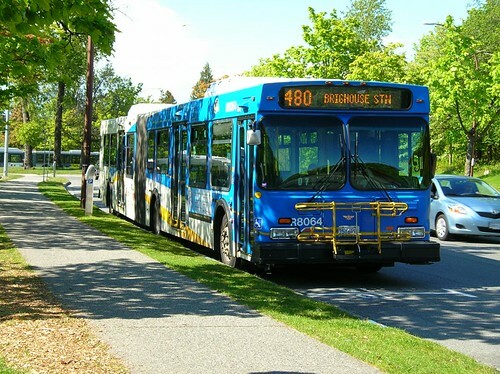 Changes Coming to Bus Routes to UBC? The #480 is one of the heaviest loading bus routes in the region. When the Canada Line was introduced, most bus routes got shifted around so that the train would do most of the heavy lifting for traffic between Richmond and Vancouver. The UBC route was an exception, since the east west routes that link from Canada Line stations to UBC were already over capacity – especially the #99 B Line along Broadway. The articulated buses from the old #98 B Line were diverted to the #480 – and other routes like the #49, #43, #44 and so on. 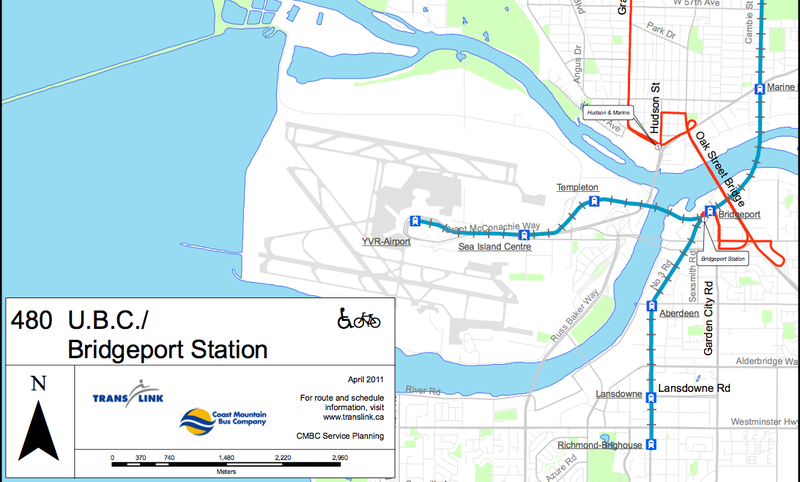 What struck me then – and is quite obvious from the map – is that the current routing to Bridgeport Station actually duplicates part of the Canada Line – and that Marine Drive Station is a lot closer. Of course, at one time the #480 would take you to Richmond Centre (Brighouse) and even, on otherwise deadhead runs, all the way to Steveston and Shell (the Richmond Operating Centre). I bemoaned its loss then. Loadings on the #100 between Marine Drive and 22nd Street stations cannot be anything like those between UBC and the Canada Line on the #480. But maybe the number gets changed if the new routing is different to the dog’s leg of the #480 (41st Ave and Granville) but took the more obviously direct routing of South West Marine Drive. That takes me back to my days working at BC Transit when I was regularly lobbied by the locals along the Drive who feared a direct bus past their doors to UBC. While there is no service bus along that route, I have seen many dead head miles run that way. So perhaps opposition these days is not as strong as it once was? One thing is for sure. If there is a reworking of the #100 expect much of it to be short turns UBC to Marine Drive and not a lot of it going all the way to New Westminster! In all fairness to the good folk of SW Marine Drive, I should make it clear that they did not so much oppose a direct bus as express the fear that we (BC Transit) would be persuaded to run a direct bus as a way for the City Engineers to then press for a widening of the Drive to four lanes. At the time I thought that showed a remarkable faith in our resources (even then buses were overcrowded and there weren’t nearly enough of them to meet demand on existing routes) and the City’s willingness to spend money on roads. While I am sure that there were some engineers who would have salivated at the thought, the City Transportation Plan was very clear in its opposition to increasing general purpose traffic capacity. And the same engineers then bitterly opposed any and all suggestions about bus priority in general and bus lanes in particular. It’s all different these days, of course. The #100 was at that time a very long and highly unreliable route from 22nd Street to the Airport. It operated from the Port Coquitlam Operating Centre as there was simply not enough room at the Oakridge Operating Centre. Though there was no deadheading – it operated on one of the New West – PoCo routes to get to and from home base. Indeed, even now reliability of a UBC – New Westminster route via South West and South East Marine Drives would be a real issue. It does now however run past the new Vancouver Operating Centre – so a lot of revenue and non revenue miles of the present #480 would be saved. I am not sure about the amount of space on the trains though.